The license plate on Jim McLaughlin's car reads "croquet"
McLaughlin is used to this. Even before the court was finished some 17 years ago, he says his neighbors couldn’t help but wonder. They said you can't build a helioport! You don't have permission and if you asked permission you wouldn't get it anyway! What McLaughlin was building in his backyard was a 6-wicket croquet court with perfectly level, lime-green turf designed to make croquet balls roll at a consistent speed. In the spring, a grounds keeper uses a heavy-roller to level it and in the fall, he keeps it clear of pine needles from nearby trees. When I arrive, McLaughlin is lounging in a lawn chair shaded by those trees. 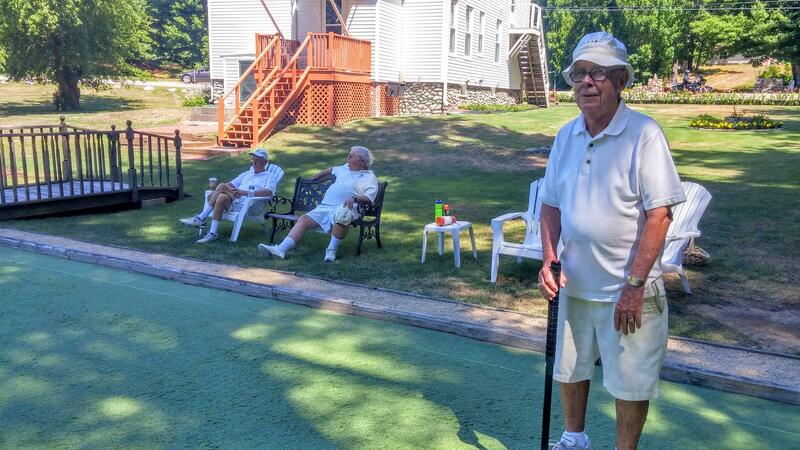 He’s sporting white sneakers, white shorts, white polo, and a white cap – traditional croquet attire. He wears glasses and is quick to flash a warm smile. As I settle into a lawn chair next to his, he tells me his relationship with croquet actually began with his love for another sport: long distance running. So about 15 years ago McLaughlin and his wife searched for a sport they could enjoy together. 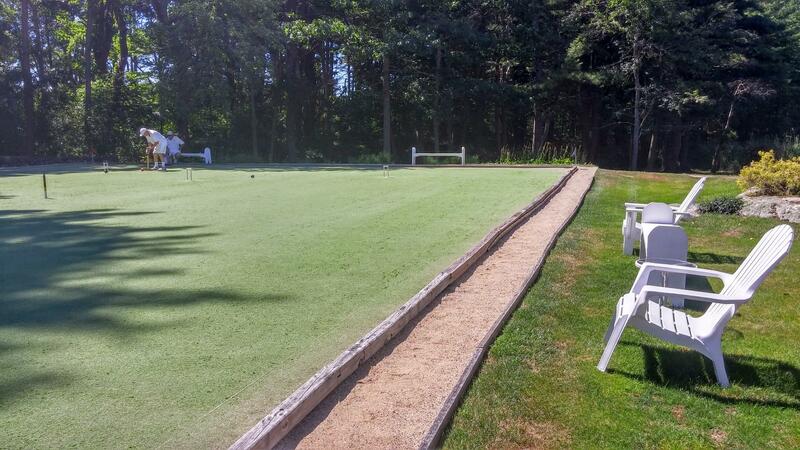 After a few months of trying croquet, they decided it was time to get serious and build their own court. And even though his wife, Maire, has died, he’s rarely alone. His backyard has become the official court for the Strawberry Banke croquet club, a magnet for professional players in the region. In fact, on the day I stopped by, some of those pros were setting up for a game. Carleton Mabee, a three-time national champion in six-wicket American croquet, gives me a few lessons before the game. I quickly realize this is not the kind of croquet you played in the backyard growing up, maybe just whacking at balls with a mallet. 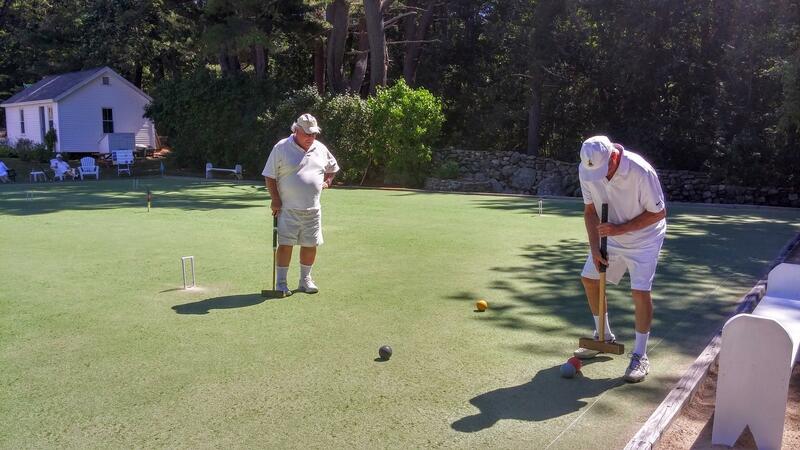 Six-wicket croquet is a game of complex strategy, where players are forced to think several moves ahead. It’s often described as a mix of billiards and chess. This morning, Mabee is playing Bert Myer, who is slated to be inducted into the croquet hall of fame in West Palm Beach, Florida later this year. As their game gets underway, a hush falls over the court. There’s only the occasional clink of the mallet hitting the ball and the sound of the ocean breeze filtering through the trees. McLaughlin and another player, Lloyd Hadden, try to give me a play-by-play of the strategies at work in the match. But despite their best efforts, I’m completely lost. It’s that sheer complexity of the game that keeps players like Hadden coming back here day after day. He jokes that it keeps his Alzheimer's away. And he says that even though croquet match may look relaxed from the outside, beneath the surface it’s another story. At some point during the match, McLaughlin mentions that his home, which sits just a few feet away from the court, is where he was born and grew up. He moved out of state after college and ended up spending most of his working life in New York City. And he used to think he would end up retiring there. But, between the family history, the ocean breeze, and his croquet court, McLaughlin says simply, "this is better."